Blackpool's Brian Rose is confident his big-fight experience will be the difference when he takes on Conrad Cummings for a version of the European middleweight title next month. ‘The Lion’ travels to Belfast in December to take on Conrad Cummings in what will be his second fight on his long-awaited comeback, having made a successful return after an 18-month exile last week. 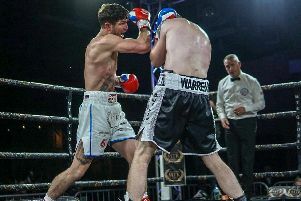 The former world title challenger picked up a hard-fought points win over Alistair Warren at Manchester’s Victoria Warehouse last Friday. 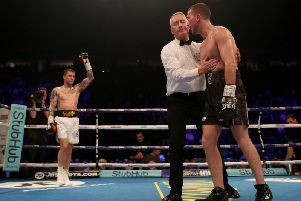 Rose then went face-to-face with Irishman Cummings post-fight as it was announced the pair would meet in Belfast on December 7 for the WBO European middleweight title. The Blackpool favourite had been originally pencilled in to face Luke Keeler at York Hall in London seven days later but the Dubliner has picked up a back injury meaning a change of plan for the 33-year-old. With the cobwebs blown off after a spell out of the ring, Rose (30-5-1-KO8) feels ready to add European honours to his collection of Central Area, English and British belts. He said: “I have respect for Conrad. I know he’s a warrior. I’m not about that trash-talk leading up to the fights. There’ll be no bad words. He believes he’s going to win – especially after watching me against Warren – but I know I’m a lot better than that. “We’ll give the fans what they want and that’s a tear up. I know I’m going to come out on top because I believe I can outfox him. “I’ve had two years out of the ring and before that, I hadn’t had six months out of the ring since I was nine years old! “I knew I wasn’t going to look a million dollars against Warren. In the past, I’ve fought for world titles and been involved in great British domestic tear-ups but I knew it wasn’t going to be one of them. Rose admitted it was far from a vintage performance as he topped the bill in Manchester. Warren had only won 11 of his previous 35 fights but played a big part in what turned into a toe-to-toe battle. After six hard rounds it was the Blackpool man who took the decision 58-57. Cummings is six years Rose’s junior at 27 and with a professional record of 15-2-1 has far less experience. His last outing was a six-rounder last month.